If you’ve been reading the news you probably know there are already a few good options of headphones on the market designed specifically for use with the jackless iPhone 7. Many of the first models on the market however are produced by high-end audio companies that are designed more for serious audiophiles than they are for average Joes and Janes..and with price ranges in the hundreds of dollars simply too expensive for many people. It’s not all doom and gloom though as there are headphones designed to provide superior audio quality of a lightning cable but wont’ break the bank doing so. 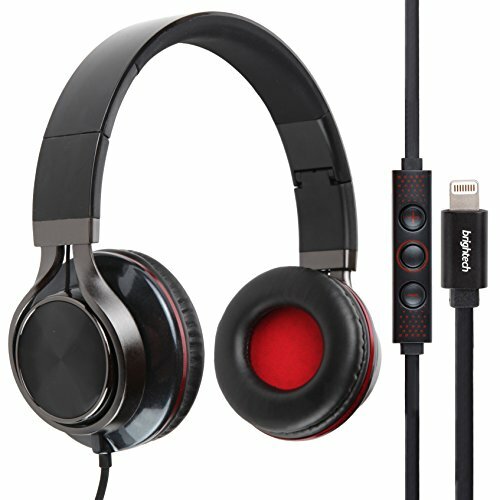 One such company that was one of the first to sell MFi Approved headphones is Brightech. What does MFi stand for you’re asking? MFi stands for Made for “iPhone/iPad/iPod”. It’s a program from Apple where they officially approve hardware and software designed to work with their products. This means the Brightech line, including the Pure Lightning are officially Apple approved! Sweet, but they must cost a fortune right? That’s where you’d be wrong! The Pure Lightning’s can be found on Amazon for as low as $39.99! No joke, these are probably THE cheapest lightning around-the-ear headphones on the market. Given the success of Brightech’s earbuds, we’re pretty excited about these full sized cans..
It’s still early as people are just catching on to the beauty of Lightning powered headphones, but the Pure Lightning’s are enjoying very positive reviews on tech sites including Amazon. Users are praising their light weight, HD sound and comfortable fit. There’s more than just a good fit to these though, they also look absolutely stunning with a black and red color scheme. The Brightech MFi Approved Pure Lightning over-ear cans provide full 24-bit digital audio in a small foldable headset. This makes it perfect for people who commute or travel as they can easily be folded down to fit in a small messenger bag or carry-on. These cans also include an in-line remote that can adjust the volume on the go. The cable itself is designed to be tangle free and is 1.2 meters long, plenty long enough to use at a desk or work station. >See how the Pure Lightning’s stack up against other lightning cable headphone options. The ear cushions are soft pleather, and the speakers themselves are powered by large 40mm neodymium magnets, which are used in headsets 5 times the price of these. The best part about Brightech products is they stand behind their quality. These headphones come with a full 3 YEAR WARRANTY. Yeah, they’re cheaply priced but not cheaply made, otherwise Brightech wouldn’t offer such an iron-clad warranty. The Pure Lightning over-ear headphones weigh in at 1.1 pounds. Contain large 40mm ndeodymium magnet drivers. Oxygen-free copper cord for a truly lossless signal transmission. Has a max sensitivity of 110dB and a very wide frequency response to match. Connects to Apple devices with an 8-pin Lightning connector. Available exclusively in a black and red color combination. At the time of publication, there really is nothing this affordable in this segment. These are truly currently one-of-a-kind cans.